Olentangy Orange’s Tanner Hegarty, left, and Olentangy Berlin’s Cayden Pomeroy battle for possession during the first half of Thursday’s showdown in Lewis Center. LEWIS CENTER – Olentangy Orange interim coach Zach Peterson entered the Pioneer field sporting a different look, with masking tape covering an Olentangy Liberty logo on his hooded sweatshirt Thursday night. He opened up the hoodie to reveal that it was originally an Olentangy garment. Peterson, an assistant principal at Liberty by day, is waiting for his new Orange apparel to arrive. The former Olentangy coach won’t have to wait any longer for his first win heading the Pioneers, though. 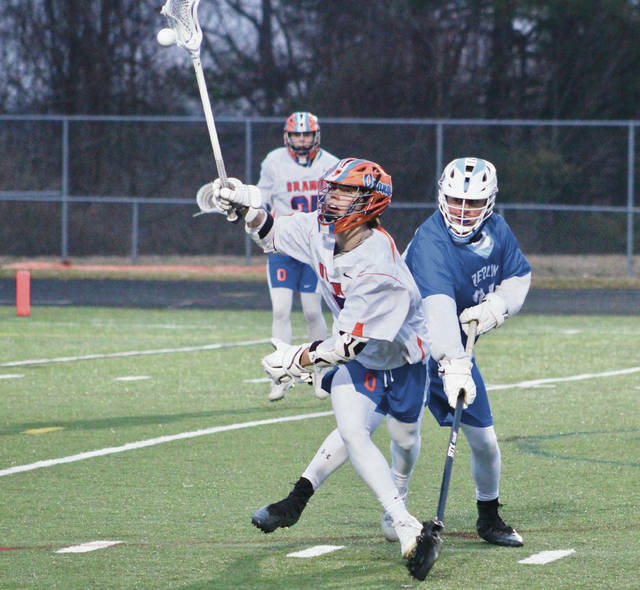 Sophomores Tanner Hegarty scored five goals and added an assist and John Stearns had three helpers and added a pair of goals to lead Orange to a 13-6 win over Olentangy Berlin in non-league play. “The upside on those guys with the intelligence and stick-skills and hard work … the program has a very, very bright future,” Peterson said. His Berlin counterpart, Dominique Alexander, wasn’t sporting any of his old Olentangy gear. The Bears hung tough for much of the first half, trailing by just two goals before Stearns hooked up with Hagerty for a second time to give the Pioneers a 6-3 lead with 4:43 left in the first half. Orange took that lead to the locker room before Riley Tomechak scored twice in a four-goal rally to open the second half to help the Pioneers pull away. Tomechak finished with three goals, William Roby added a pair and Luke Applegate and Mitchell Gifford each had an assist to lead Orange (1-1). Tanner Davidson had three saves in goal. The offensive onslaught comes a couple of days after the Pioneers were held to just one goal against Delaware Hayes. Gavin Angell had two goals and two assists and David Sexton, Jack Nebraska, Drew Haver and Elijah Emery each added a goal for Berlin (0-2). Goalkeeper Sam Warner highlighted the Bears’ effort with 16 saves in goal. “I was happy with our guys’ effort,” Alexander said. “We expect that from Sam day in and day out. He likes that challenge of knowing that we put that much pressure on him. Berlin is back in action Tuesday night at 7:15 p.m. at St. Francis DeSales in non-league play. Orange is off until Apr. 4 at 7 p.m. when it opens OCC-Buckeye competition against Westerville Central at home. The Olentangy Berlin girls lacrosse team made a little history Thursday, notching its first-ever win. The Bears did it in style, too, rolling 21-2 over visiting Whetstone. Andi Henry, Dacey Redman and Libby Cuckler spread the wealth with five goals apiece while Izzy Conrad and Courtney Suchan had two each. Bri Hibbits and Sophia Martel took care of the rest, stopping five of the seven shots they faced while splitting time in the Berlin goal.